Its 3:30pm and we have been on site for 5 hours. The Baptist Mission Hospital here in Fermathe has two doctors and about 100 beds. 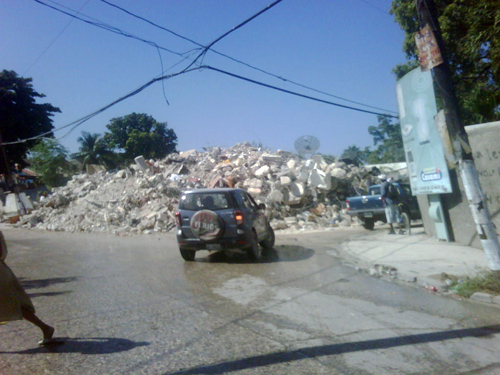 Since the hospital is 20 miles north of Port au Prince, it is normally used as a referral hospital. But it is all pretty simple; it did not have even a basic lab until last month; it does not have blood for transfusions; and it is very elementary. For example, we have one patient being transfused. She had a gastrointestinal bleed last night and her hemoglobin is only two. There is no blood, so she is being transfused directly from the vein of a doctor of the same blood type. All serious injuries are coming here. The hospital consists of a single functional operating room, two large ward rooms, and a single long hall connecting them all. It has been overwhelmed. It has been packed all day. You can barely move through the hallway. We quickly toured the facility, made an initial assessment, and then we met with the exhausted limited medical staff. Findings: Shortage of nurses, no triage going on, no medical records, no place to house postoperative patients. We have an anesthesiologist with us, but we lack basic anesthesia equipment. Patients: All ages, mainly fractures, the wounds that are now 6 days old are all infected. There is a shortage of pins and plates to stabilize the wounds. I’m in a meeting now with 6 Samaritan’s Purse members and hospital leadership addressing the issues above. More later. We need to unload the antibiotics. Last night, we visited Double Harvest Hospital about an hour away from Baptist Mission Hospital. It is a tremendous facility that is in early stages of establishing a relationship with Harvard's Partners program. 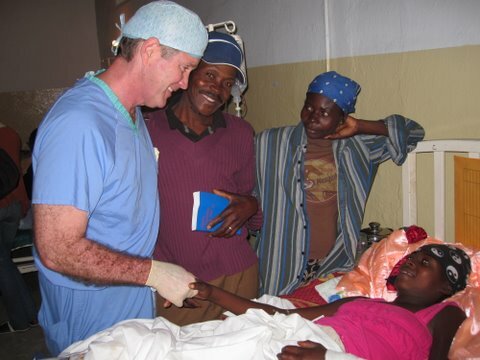 We decided to send one of our surgeons there (Dr. Warren Cooper, who all of my boys have operated or been with in Sudan over the years). Warren can do it all. Then back to the hospital compound where we were treated to a fantastic home-cooked meal (I asked, “What's the sauce for the rice?” The cook said "I don't know but you will like."). Great conversation as everyone gathered in their scrubs, exhausted, to recount their experiences of the day. The nurses have got things really organized. We were sleeping in sleeping bags by 10pm. Slept well in room with 8 others. We can't drink water, and there is no hot water. Very comfortable though, seriously. Up at 5 am to take 45 min. rough journey to town. Palace in shambles as you see on television back at home. Thousands and thousands of people displaced to field and the square in front of palace. Obviously no water and no latrines. The sights and smells in the early morning hours you don't feel from tv ... Stench, some crying, people searching for water, fires burning. We are now running to the airport early am for supplies. Only thing short supply now is cast materials and pins to externally fix broken bones. Ran into a medic (James L. Clark) who is former special forces and who did medical work with me just after Katrina when we were both seeing some of the 3000 patients who flooded New Orleans airport just after levees broke. Small world and big hearts. As I'm on the tarmac looking through palettes of supplies, I think how much regular old people at home have helped in response to my personal requests ... The medicines and IV fluids I brought in are now in people saving their lives. I think of the people at Centennial Medical Center (Tom Herron and Micki Slingerland who met me early Sunday just a few hours after my call) and the people at the local Walgreens on Harding and Jennifer Dilliard (district manager) who today are sending in some much needed antibiotics. And all the people who have contributed to our foundation Hope Through Healing Hands (I am immediately channeling the money to where I know it can be used on the ground right now, making the most difference.) Thanks to all. We got to bed late last night after ward surgery - sleeping 14 people in a house on the hospital grounds. Early this morning, we were awakened to violent shaking. It seemed to last a minute, but probably only 15 seconds or so. It felt like someone was shaking me to wake up. Within seconds, hundreds of people throughout the hospital were wailing. The memories of the loss of children and crushing buildings are still so raw for those suffering already, this aftershock was a grim reminder of the pain and suffering they’ve been through over the past week. With a single aftershock, things settled down after an hour. No one is hurt here, but it is still psychologically damaging, and those wounds will take much longer to heal. We met in house on compound as a medical team; there are 15 of us. Nurses presented plans for assigning responsibility. One nurse is overseeing wounds, another all meds. T departing Ecuadorian rapid response surgical and medical team briefed everyone else on what they would see as next phase. Then we discussed among ourselves the best combinations of antibiotics, dependent in part on what supplies we have. We have enough supplies for 2 to 3 days, but more is on the way so no reason to overconserve. She is a 16 year old schoolgirl still at school at 4:30. The earthquake hit and the building crumbled around her, killing 6 others. Dad, knowing she had stayed at school, went that night with flashlight and search for his daughter. He told me he found nothing but piles of boulders and concrete where the school had been. Going from mound to mound, he called out her name ... Nothing but collapsed building. He helplessly called for hours wandering from pile to pile of building rubble. Miraculously, she recognized his voice, and she responded from beneath 6 feet of rubble and concrete. She called backed, hearing her Dad calling her name. It was pitch dark, but he directed his flashlight in the direction of his daughter's voice. He spotted the back of her neck through the deep pile. He told her that she would be alright. He ran back to get his son to help remove her from the crushed debris. Using just a shovel and pick, they worked to get her out. While buried, they could not get food or water to her because she was crumpled over and face down. On the third day, she was freed. Three days of father and son digging. She was brought to hospital and waited for 24 hours. Her right leg was swollen and crushed. Fascitomy. Left forearm swollen -- fasciotomy. No sensation in leg or hand and grossly swollen. But she is alive ... And thankful. On rounds yesterday her appreciative Dad opened his Bible to John 3:16 and pointed it out to us. It was in Creole so we, of course, couldn't read it. Today she looks great and her brother was eager to help massaging her hands for physical therapy. This gives some feel to what we are doing and seeing in Haiti. Thank you for reading. Please read more on Senator Frist's Blog.